Stories from: Kelley Armstrong, Rachel Caine, Kami Garcia, Nancy Holder, Melissa Marr, Beth Revis, Veronica Roth, Carrie Ryan, Margaret Stohl. Sooooo.... What are you Waiting on this week??? OOoh I might have to get this one! Oooh, cool. A bunch of short stories by some pretty impressive authors. I may have to check this out! I'm always hesitant of books with multiple authors, but this sounds more like an anthology than one tale written by multiple people - and it's KELLEY ARMSTRONG AND MELISSA MARR!! How can I not want to pick this up?! OH WOW! I may HAVE to check out this one. I adore Kelley Armstrong too, and her Darkest Powers trilogy is one of the first series that really encouraged my interest, as an adult, in YA! OH YES. I can't wait for this one. There are way too many amazing authors in this one book for me to pass it up. The cover is so pretty and dark. This one is definitely on my list! Ooh, there are so many great authors here! I pretty much love all of them - will definitely have to read this book then. Fab pick! Ooh, I haven't seen this until now. 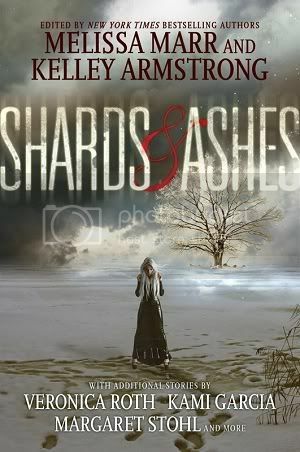 A lot of great authors and edited by Kelley Armstrong and Melissa Marr??? Wow! Great pick!